Why are clients still scratching their heads about Social Media? Home / social media / Why are clients still scratching their heads about Social Media? I read an interesting report in the Telegraph yesterday that says London is the “social media capital of the world”. This is not hard to believe – a city of 8 million people that the Telegraph claim would rather tweet than talk to each other on the tube. But with such a focus on social media in London, and the accompanying concentration of “social media experts” popping up faster than a twitter trending topic, one is left to wonder why clients are still scratching their heads about social media, and what they should do. The current thirst for information on this new topic seems to increase daily. Conference organisers are rubbing their hands together as they organise another “twitter conference” – and are guaranteed a sellout. But there is a broader issue here. My concern (as happened in the mobile advertising space) is that for all this advice, not much seems to be translating into action. Why is this? I believe it is because social media for a company probably represents a greater step change than the web and online ever did. A step change is happening in the marketing, advertising, communication and PR space. Why? Because via social media (no matter what the website or service), consumers can now talk back to brands, and tell them what they really think. The purist market researchers claim that this is “dirty” research, because it has not been “scientifically” conducted in a walled room behind a one way mirror after work for a £40 per diem. Instead, social media gives brands an unfiltered view of what consumers really think. 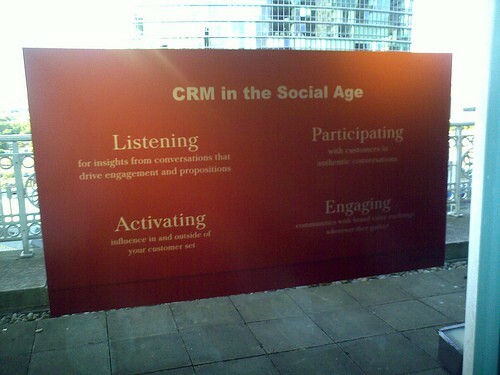 Any gap between [marketing and operations] drives a conversation on the social Web. Wow – we’ve cracked social media – now what? What we will face is that very few (if any) of us have formal training in “social media”. We all have a degree in “real life” but this does not translate well to the traditional world of advertising, marketing and PR where everything must be measured and controlled. With social media, as per the quote above, all the hard work by the marketing team can be undone by a poor customer experience and an angry tweet. Think “United Breaks Guitars”, which wiped $180 million of United’s stock price. 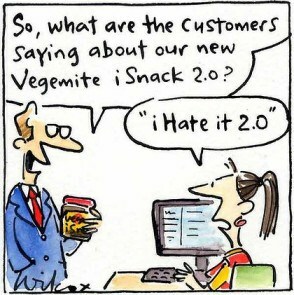 A more recent example is the attempt by Vegemite in Australia to brand a new variant of their product as iSnack 2.0. Overnight Kraft has agreed to scrap the new name due to consumer feedback. Cartoon credit: Cathy Wilcox and Sydney Morning Herald. I would argue that a few short years ago this would not have happened as fast. Back then it wasn’t easy to “tell a brand off” in public. You had to get a letter to the editor published that would not offend a one of the paper’s major advertisers, get through to a radio talk show or run the gauntlet of a company’s PR machine trying frantically to hose down bad news. Along with this change we need a new breed of social media leaders. Recently Revolution Magazine ran a story suggesting that the lack of social media talent will harm investment. They have a valid point. In a follow up post, I will outline what I believe are the new skills that marketers and leaders will need to survive in this new world. In speaking to my local friendly Starbucks Barista, Laura who is studying an MBA majoring in marketing, I asked her what social media subjects or themes were being taught. Listen, Learn, Engage and Integrate. It’s not too late to learn how to listen. Yesterday I was fortunate enough to visit the Ogilvy headquarters in Canary Wharf where they were running a social media day. They had a brilliant line-up of speakers such as @jbell99, @PeterFriedman, and @rorysutherland. You can search the tweets from the event using the hashtag #ogilvysocial (grab some gems before twitter archives them). When a major advertising agency (or at least their 360° Digital Influence team) starts using this sort of language in front of clients, you know the world is changing.